Montreal, April 2009 — Dorel Distribution Canada is issuing a voluntary public notice for the bassinet portion only of the Eddie Bauer Sooth and Sway play yard model numbers 05044CFRK, 05044CSNW and 05044CWPR. The Eddie Bauer Soothe & Sway Play Yard is a portable play yard sold with a rocking bassinet, built-in changing station and a mobile with three teddy bears. Only play yards manufactured prior to December 31st 2008 are affected by this public notice. Both the model number and the date code can be found on the sewn- in warning label located at the bottom of the play yard. If a child is left unattended in the bassinet portion of the play yard in its unlocked rocking mode, the range of motion may allow the child to roll to the sides. There have been no reported injuries. 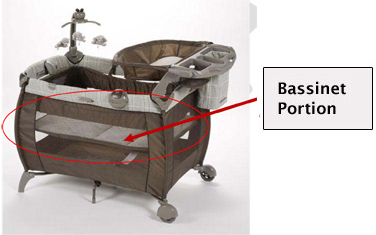 Consumers should immediately stop using the bassinet portion of the play yard and contact the company by visiting the website for complete details athttp://safetynotice.djgusa.com/play_yard/ or contact Dorel Juvenile Group at (888) 233-4903 between 8 a.m. and 4:30 p.m. Monday through Friday. Consumers should not return product to retail stores.